With 2012 approaching soon, I’ve been thinking about my goals for the new year. Unsurprisingly, most of them fall into geek territory. Tech Workout: I’m already hitting the gym, so I don’t have to deal with that pesky “get fit” resolution right now. However, I do need to find new ways to keep myself entertained at the gym when I’m not there with my husband or my personal trainer. Music helps me keep a good pace on the treadmill. I resolve to make and use ten or more different workout playlists for the gym. With digital music, there’s no excuse to avoid this motivational tool. Stop Hating Apple: Right. It is actually possible to be a geek but love PCs more than Macs; I’m one of those people. That said, I’m really getting used to my new iPhone. Aside from having a sassy Siri sidekick that can dish out sarcasm, the iPhone has an awesome camera with a reversible camera (kind of like the CoolPix). My next step? Attach an Apple keyboard to my PC. I’ve noticed that my typing speed increases by about 20% on a Mac keyboard–and time is money for a full-time writer. Maybe in a few years I’ll even switch over to the Mac platform entirely, though the interface really takes some adjustment. I won’t let myself use “Mac technology isn’t as awesome” as an excuse this year when there is an Apple product readily available. When I attended undergraduate classes, my goal was to become a writer who covers music, movies, and TV. Now I’m living the dream–but I need to sharpen my skills and take it to the next level. Places and People: Assuming I can earn the big bucks with the previous goal, I would like to focus on seeing people and places rather than acquiring more stuff. Yes, it would be awesome to have a life-sized replica of Han Solo frozen in carbonite, but I’d rather take trips to conventions. 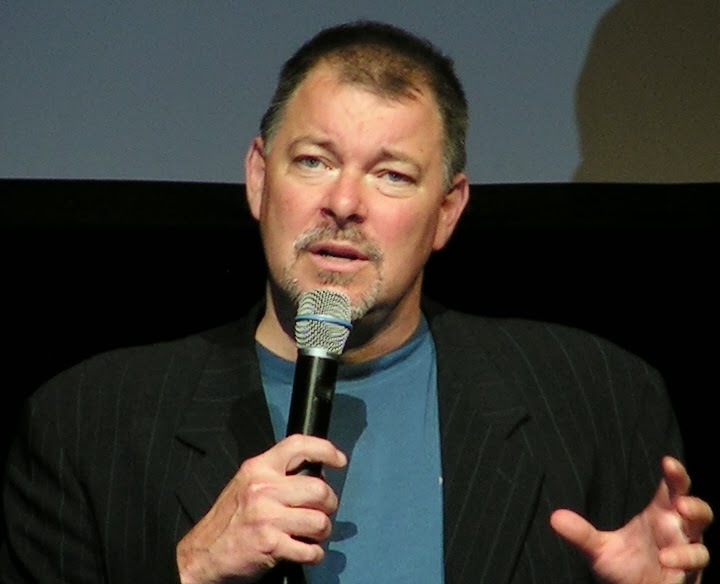 Meet Jonathan Frakes: My number one nerd crush is Jonathan Frakes, AKA Commander William T. Riker from “Star Trek: The Next Generation.” He doesn’t do conventions extremely frequently, but he will be at one coming up in 2012. I cannot wait to meet him and get the picture (I already have the Riker tee shirt….seriously).